very nice perspective. well done in B&W. I love this perspective and it so suits the black and white, nice contrasts. What a fantastic perspective you created here!! Beautiful!! Equisite black and white exposure. Love the detail. great perspective, i love it! Perfect lighting with complimenting dark tones; impressive. Beatiful B&W picture. I like the contrast. Very good B/W and contrast! Always amazing your Photos !!!! I like this one a lot, nice framing and superb b&w treatment! Wow. Perfect black and white. 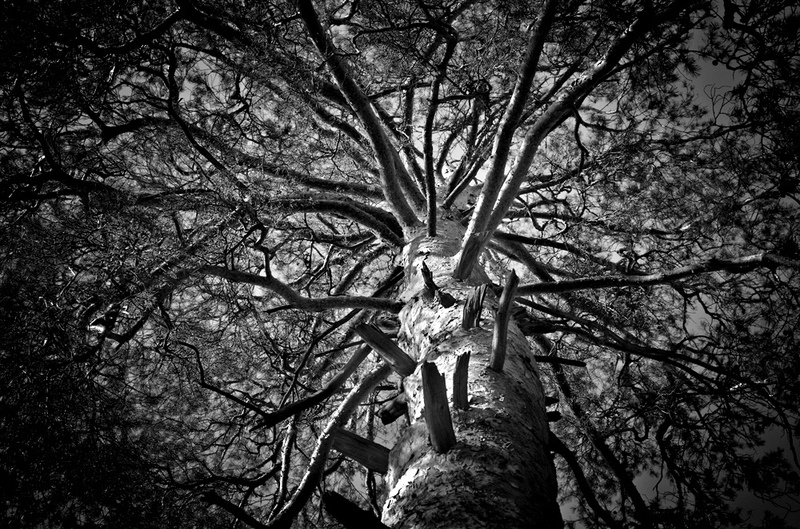 Love the the dark cornes just brings the attention to the center of the great climbing tree :-) And nice black and white work. It is very fascinating to look in this tree crown - it keeps imprisoned the look - wonderful shot. How beautiful this calm autumn scenery. It`s beautiful to see the fire soo close - exactly the right shot for a cold day. Any possibility of getting this as a print somehow?! Amazing stunning photograph!